La Niña 2017: what are the impacts on East African weather? For agricultural practices it is very convenient to be able to anticipate on the coming seasons’ weather. Especially in Africa, where most of agriculture is rain-fed, it is very helpful to know in advance if it will be a relatively wet or dry season, so farmers can choose the optimal crop or variety. Forecasting the weather on seasonal timescales is more difficult than forecasting the next few days. One of the reasons for this is that seasonal patterns depend on the status of the global climate system, including the oceans. An example of a well-known seasonal pattern is the El Niño phenomenon. El Niño is an event of unusual warming of the Equatorial Eastern Pacific Ocean in December and it has effects on the weather around the globe, especially on rainfall patterns in the tropics. El Niño is the warm phase of a larger phenomenon called the El Niño Southern Oscillation (ENSO). The opposite of El Niño is called a La Niña, which describes a cooling in the Equatorial Pacific Ocean. In 2015 we have seen a big El Niño event, that affected agricultural production in many places in the world. The system is now reverting to a La Niña. In figure 1 we are looking at seasonal (long range) forecasts for sea surface temperature made by the European Centre for Medium Range Weather Forecasting (ECMWF). 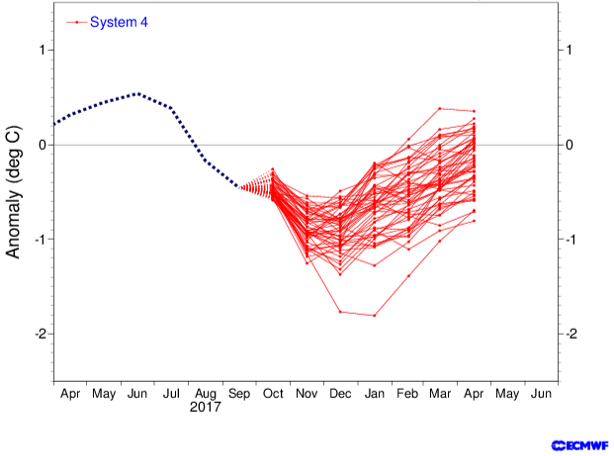 All the ensemble members of the model (red lines) are negative, indicating that a solid La Niña is forecasted the coming half year. Unfortunately the models did not predict this La Niña well ahead; half a year ago they even had a tendency of predicting another El Niño this year. The situation demonstrates how difficult it still is to predict the occurrence of El Niño long in advance. Figure 1: El-Niño forecast of an ‘ensemble’ of models for the coming months in red, observations in the black dotted line. Negative values indicate La Niña. 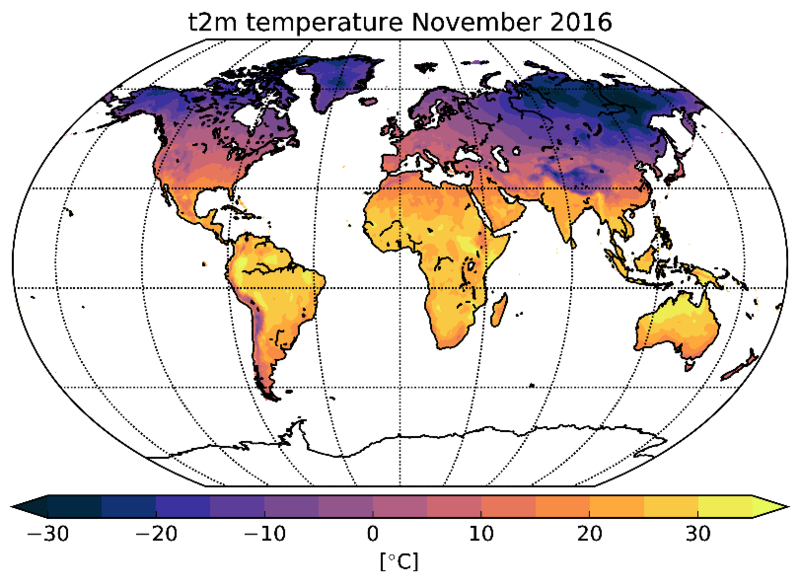 The figure is created by the ECMWF and can be downloaded here. The current rainfall patterns show that in most parts of Eastern Africa, the rainfall season of summer and autumn 2017 was not as dry as in 2015 and 2016. Figure 2 shows the Standardised Precipitation Index for rainfall in the last 90 days, based on CHIRPS rainfall data. Blue colours indicate above average rainfall. Note the enhanced rainfall in Western East Africa and large parts of Ethiopia, that is likely to result in improved yields for most of farmers rains in Kenya, Uganda, Ethiopia. Other countries (especially Somalia and Eastern Democratic Republic of Congo) experienced reduced rainfall and a poorly performing season. 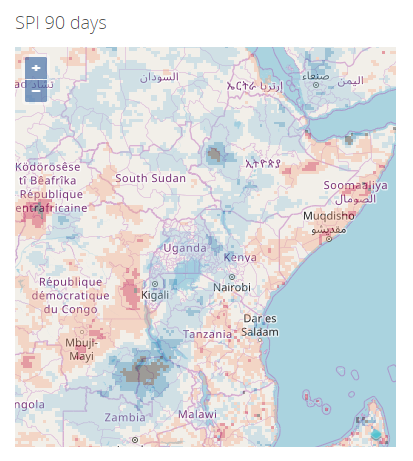 Figure 2: Standardised Precipitation Values of 90 days accumulated rainfall over Eastern Africa on 20th October 2017. Blue colours indicate above-average rainfall. This figure is created by Weather Impact based on CHIRPS data. What is the expected rainfall for the coming months in East Africa and do we see an effect of the forecasted La Niña? Historically, La Niña correlates with below-average rainfall in the months December to February in parts of Eastern Africa, whereas Southern Africa is wetter and cooler than normal. The seasonal precipitation forecasts of ECMWF for the next three months (November, December, January) are shown in Figure 3. Yellow and brown colors indicate that it is more likely to be a dry season than a wet season, whereas the green colors indicate that it will be more likely a wet season than a dry season. The forecasts show above-average rainfall over Tanzania, Malawi, Mozambique and Madagascar and not a clear defined ‘dryer than normal’ area; a little different for the historically known fingerprint of La Niña. Note that the figure only shows the most likely scenario for this year. Time will learn if these scenarios were right. It is our goal to explain the remaining uncertainties as good as possible to the stakeholders of reliable weather forecasts, among which farmers, to support optimal decision making in the agricultural sector. Figure 3: ECMWF seasonal forecast for rainfall in the months October, November, December. The colors indicate the probability of the most likely category of precipitation. The figure is created by the ECMWF and can be downloaded here. The Netherlands Consortium on Climate Change Adaptation is a broad coalition of Dutch knowledge centres, dedicated to providing multisectoral, integrated, practical knowledge and expertise on climate change adaptation. Take a look at the website of this initiative, or read the article in Volkskrant (Dutch). Weather Impact is associated partner in the CCCA initiative. For the further development of our company we are looking for an enthusiastic fulltime co-worker for the realization and management of projects in the field of operational weather services. Interested to work at our company? Please check the enclosed vacancy. Weather Impact has currently three vacancies open for internships. We are looking for enthusiastic students from different disciplines to expand our team. Develop a statistical method to predict convective weather patterns from output of numerical weather prediction models. Scan the African market and work out which weather-information-products have the best market opportunities for Weather Impact. Creeër inzicht in de problemen en uitdagingen van de klanten van Weather Impact op het snijvlak van voedsel, landbouw en weer. The World Bank launched a global call to find big data solutions that addressed issues in the critical challenge of Food security and nutrition. The goal was to help better understand the impacts of climate change and positively influences decisions by using big data effectively. Weather Impact has taken up this challenge and created the innovate Banana Network. With our application we are recognized as Honorable Mention Winner by the World Bank. Banana production is highly sensitive to the impact of global warming. The Banana Network is an artificial neural network trained by big data on global weather and banana production. It provides local producers reliable information on their estimated yields and can be used to assess productivity in a warming climate. The model uses open source big data, is scalable and has unlimited training capacity. Knowledge from the Banana Network will help farmers and producers to (1) plan investments more effectively, (2) receive a fair price for their crops, and (3) take early action in the event of a potential disaster. Watch here our new video-pitch about CropMon. The CropMon service in Kenya provides local information on weather forecasts, current crop growth and farm management practices. Weather Impact delivers tailored weather forecasts and monitors current weather conditions. 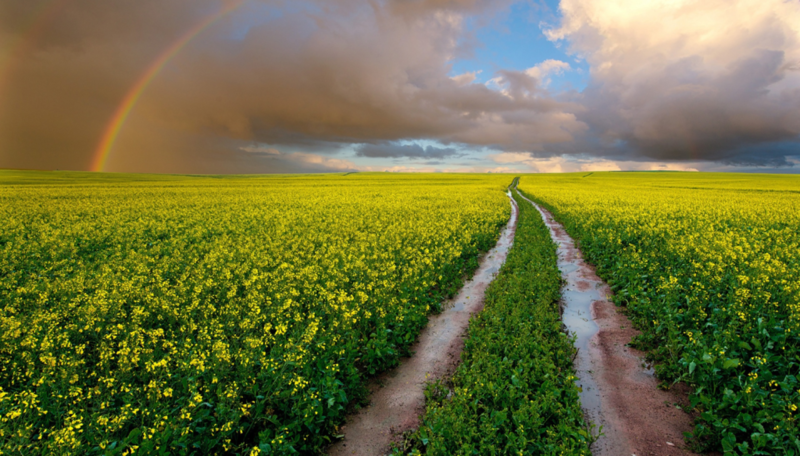 Farmers receive text messages with weather forecasts and farming advice on a regular basis. In addition, innovative smartphone- and web applications are developed for farmer organisations and other stakeholders. Weather Impact is involved in several projects in Africa as a provider of information on daily weather and climate risks. These projects are part of the G4AW, a programme that improves food security in developing countries by using satellite data. This video published by NOS includes an interview with a Ugandese farmer how the technology that is developed in a G4AW project helps him to improve his agribusiness. On our projects page you can find more information about our activities in Africa. Weather Impact wishes you a climate-smart 2017! We are glad to announce that we have expanded our climate services with a monthly Climate Bulletin. The bulletin gives a global and regional overview of last months’ climate. Temperature and precipitation hot spots are discussed and interesting weather events are highlighted. See here the example bulletin of November 2016. If you are interested in the current Climate Bulletin for your local area, please email us at info@weatherimpact.com. 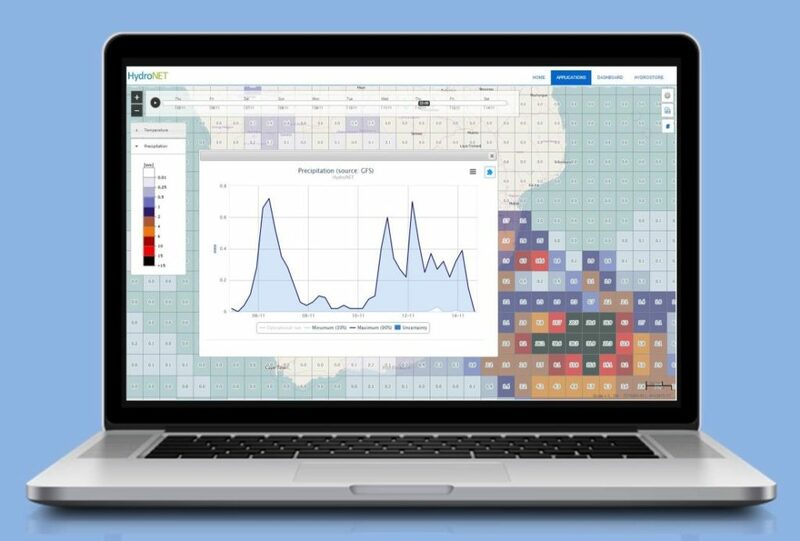 Weather Impact submitted an innovative idea to the World Banks’ big data innovation challenge (link to: https://bigdatainnovationchallenge.org/) for food security. As banana production is highly sensitive to temperature and rainfall fluctuations, it will be affected by rising temperatures and changing rainfall patterns. We have therefore developed the Banana Network. 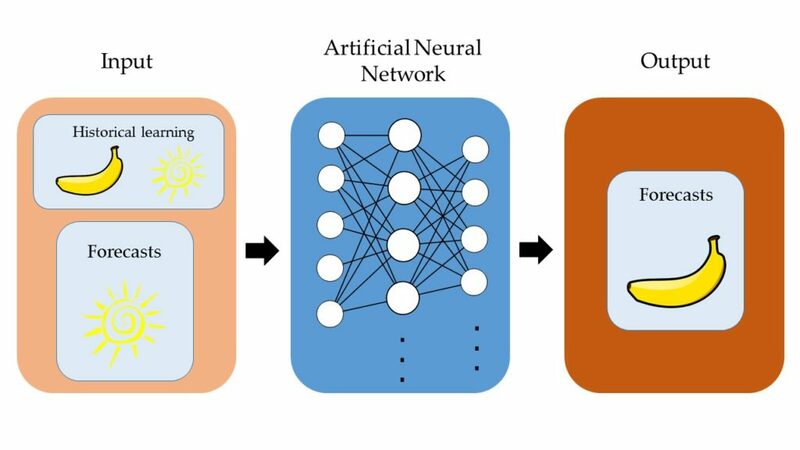 This innovative model is based on an artificial neural network and trained using big data on global weather and banana production. It provides local producers with reliable information on their estimated yields and can be used to assess banana productivity in a warming climate. The model uses open source big data and is scalable to local levels. Are you interested to know more about our activities using big data and artificial intelligence to determine climate risks for food security? Please contact us. 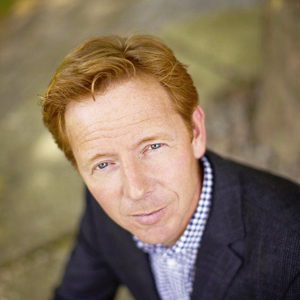 We congratulate Gerrit Hiemstra with his position in the ‘duurzame 100’ (sustainable 100) election in Trouw, a Dutch newspaper. More information can be found here.